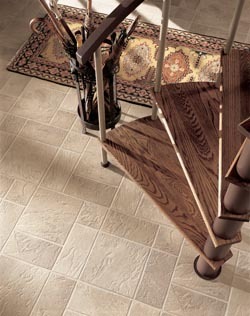 Modernize the appearance of any room in your home with our selection of stunning vinyl flooring. These floors are resilient and help keep your home looking as good as new for years to come. You save time and money each week on cleaning, and they are sure to match whatever design plan you have in mind. With a broad array of patterns and colors to choose from, the only limit to your design plan is your imagination. When you visit our showroom, meet with one of our design specialists to find the right types of flooring for your lifestyle. If you have a home full of pets and kids, you need a floor that can withstand the scratches and stains you can expect every day. Let us replace the worn and faded floors in your home with modern, stylish, and comfortable flooring. Our sheet vinyl flooring starts at $2.19 per square foot. Our vinyl flooring is also great for commercial applications. Entice new customers into your place of business with new vinyl flooring from our showroom. When you create a clean and colorful environment for your employees, they are sure to look forward to every day at work. Expand your design horizon and cover more of your floors for less with our selection of vinyl tile flooring. This approach to flooring gives any room a striking look filled with style and sophistication. Your favorite rooms will come alive with this flooring that speaks to your level of creativity. We take the time to listen to your needs, and this helps us find the right vinyl tile flooring for you. Bring in your design plan and any samples you may have, so that our design team can help you find the right surface for modern living. When you choose from our selection of vinyl sheet flooring, you get a durable and scratch resistant surface that is perfect for your busy lifestyle. With a home full of kids, you need a floor covering that can maintain its color and shine for years to come. Keep your home cleaner, and your family will feel the difference. Vinyl sheet flooring is easier to maintain, and with no seems, there is less area for dirt and debris to hide. Your family will breathe easier, and you won’t have to spend as much time on your hands and knees scrubbing away. Create a feeling of warmth and character in your favorite rooms with the versatility that vinyl plank flooring provides. This surface can withstand the effects of moisture and won’t expand and contract with the changes in weather. This flooring is essentially the same as our luxury vinyl tile, which is also known as LVT. You get the style and substance that come with a rustic hardwood look and you save money in the process. This cost-effective alternative to wood flooring is great in places with heavy amounts of traffic and moisture. Elegance doesn’t have to be expensive when you work with vinyl plank flooring. Protect the investment you are making in your home when you work with our vinyl flooring installation team on your next home improvement project. You need the right tools and years of experience to get the perfect fit for your home or business. Avoid the potential long-term costs of poorly installed floors with the help of our vinyl flooring installation team. Our competitive rates and precise approach to installation means you will save money in the long run. Contact us today for a free estimate on pricing for new vinyl flooring in your home. We proudly serve customers in Lansing, Okemos, East Lansing, Holt, and Haslett, Michigan, and surrounding areas.